OTech: DICOM images on your smartphone: DHIR instead of FHIR? DICOM images on your smartphone: DHIR instead of FHIR? 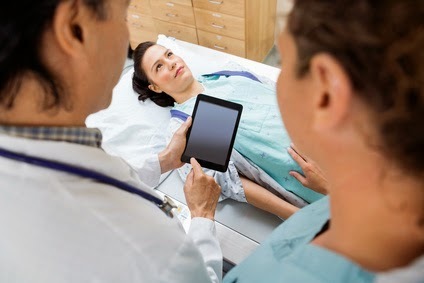 The need to provide a web-friendly version of the DICOM protocol was acknowledged more than 10 years ago, when WADO (Web Access to DICOM Objects) was added to the standard. This option did not really gain any traction until it became part of the XDS-I (cross document exchange for imaging) profile definition several years later. WADO compatible viewers are also relatively new, they did not appear on the market until a few years back. WADO was the first important step towards a more web-friendly protocol, instead of the traditional DICOM negotiation that has to take place before any image communication can happen, it provides a simple http call or uri (uniform resource identifier) request that includes a pointer to a specific DICOM object using a UID while specifying the content type, for example a dicom, jpeg, or could even be a xml or rtf for reports. In the meantime, a group of healthcare IT professionals came up with a new concept which they named MINT (Medical Imaging Network Transport), which took the web transport mechanism a step further and also changed how the metadata is being packaged while exchanging the images. There have been a few implementations of MINT, but more importantly, since then, the Working Group 27 of the DICOM standard has taken this into account and included the key concepts of MINT into the DICOM standard as “RESTful DICOM” extensions, very similar again to the HL7 FHIR concepts. What does RESTful DICOM mean? Well it uses the http protocol, including the authorization, and encryption capabilities of the web communication protocol. The major change is that a request can get the complete metadata of a DICOM object in one request. In addition it allows for “bulk” transfer of information with a clearly defined beginning and end. It is referred to as WADO-RS. By the way, there is also a so-called WADO-WS defined, which basically requires a message “envelope” to be exchanged in the form of a SOAP message (simple object access protocol), another intermediate step to the RESTful WADO-RS. As part of the RESTful services, in addition to the new capabilities for bulk transport (i.e. multiple images in a single transaction) and the capability to retrieve only the metadata (DICOM headers) for a study, there are also new protocol services defined, i.e. the WADO-RS, and the capability to do a web-services store (STOW-RS) as well as a query (QIDO-RS). Does this mean that all devices supporting the “traditional” DICOM protocol today are going to be changed? Certainly not, similar to HL7 that has a very large installed base of version 2 implementations, there is also a huge installed base of DICOM enabled devices, so as HL7 is not going to move all of them to FHIR, DICOM is not going to move them to DHIR either. However, for new applications such as small footprint viewers, plug-ins, apps on mobile devices and tablets, these new standards are a great tool. I expect that it won’t take long before we will see implementations being offered. Generally in all this nations are generally understand the value involving advanced schooling. With 1980s American president Ronald Regan take numerous actions to boost the more expensive educations. grabmyessay consumer reviews is best one and really awesome custom essay writing service providers. In light of current circumstances in this countries are for the most part admire thehadoop training in chennai worth including induced training. With 1980s American president Ronald Regan take distinctive activitieshadoop training in chennai to help the more rich headings.. Your blog is really nice , thanks for sharing. I read this blog completely it is easy to understand the information. Your post is really great. Thank you for taking time to provide us this exclusive information with us. I really enjoyed by reading your blog. nice explantion ,it was interesting article.thanks for sharing this valuable information,it is helpful to us to improve our knowledge. It is awesome article.I like this information.It is very useful blog. It is new to me thanks for discussing this concept This technically advanced software will be used for many other sectors. Nowadays advances technology are developed more and more.In smart phone DICOM images are used. Great post.Thanks for sharing useful information.Really it's very useful for everyone.Some people will be eager to learn Microstrategy training course in best institute.We are providing best Microstrategy training in Chennai with placement support.We are providing world class training for that kind of people. health is most important to all the peoples. this blog try to say DICOM images are helps ours health. thank you for this article. For me this is new topic thanks for informing us to gain the knowledge . it is useful and efficient. As soon as you send a survey to your potential customers, you may get an immediate response if you offer some good deal or an attractive reward for filling out your Smartphone survey. Thank you so much for sharing. it’s useful for me. We expect that the new LG V30 will be a super success when it launches at the upcoming global event. Do you know about LG V30 Release? Thank you very much this website provided was very helpful information and well appreciated CCNA jobs in Hyderabad . When you tap it the.cab file should then install by itself. If you did everything right you will have some new free smartphone apps. Really awesomely written post. I really admire your effort. Keep us engaged with more posts like these. Really awesome post! This is really informative and worth reading. Keep us updated. IHE XDS Implementation Issues Part 2.